Click on the image to learn more about the SEQR process. At the April 10th public hearing on the Kingstonian proposal, over 50 speakers provided three hours of testimony. 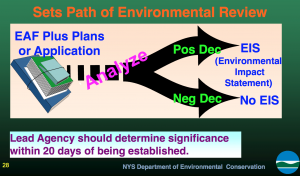 Most of which had little to do with the decisions that were currently in front of the Planning Board as Lead Agency of the State Environmental Quality Review Process (SEQR) in making a Positive or Negative Declaration for the project. Below are three citizen comment highlights that speak directly to the current process the proposal is currently in. No decisions were made that evening. Filmed by Clark Richters of The Kingston News. Brought to you by KingstonCitizens.org. “I’m a little perplexed by a lot of the discussion we’re having tonight. I thought we were not here to decide ‘yay’ or ‘nay’ on the project. I thought we were here to decide whether the project would have a positive declaration of significance or not. The SEQR process is there to help communities think through large projects like this and it just seems really clear there the impacts are significant. Certainly significant impact on neighborhood character, we’re talking about a neighborhood that’s historic full of lots of two and three story buildings we’re going to put this giant modern building in it – that’s a significant change to the community character. In the language of DEC’s guidance, “Is the proposed action inconsistent with the predominant architectural scale and character?” Yes it clearly is. That’s not to say it’s not a good project, that it shouldn’t happen or that the negative impacts outweigh the positives. That’s what the SEQR process is for is to look into those impacts and weigh them. We know that there is going to be traffic increases in this already very congested area, again – that’s not a reason to decide yay or nay today – that’s a reason to study the impacts and importantly the SEQR process calls for looking for ways to mitigate those impacts to find ways to redesign the projce so it will be better. I’ve heard advocates of this project saying “It’s not going to happen if a positive declaration is made”. To me, that suggests that the impacts are so significant that something would come up and stop the project. If the members of the planning board agree with that concern then you have to declare a positive declaration so that we can study those impacts and design the proper mitigations. SEQR is not an optional process – it’s not that you engage it when you don’t like a project and want to kill it and you skip it when you like a project and want it to go ahead….and the Mayor’s recent action to remove people from the HLPC suggests after they voiced these concerns that there is an attempt to subvert the process going on here. Suggesting that…developers won’t come here unless they can count on the city to subvert the process is even more concerning. “The Kingstonian could, without a doubt, be an exciting possibility for our city. It has also become a very polarizing issue. Continuing to focus on the negative “pro versus anti” doesn’t help and I would prefer to concentrate on the “all of us” in this picture. The “all of us” is a fair and transparent SEQR process. It is important to allow public participation in anything that affects the community on this grand of a scale and it is just as important in helping the developers to get it right. The Kingstonian project is being proposed within a National Historic District, which means it is an area officially recognized by the United States government for its national historical significance. I urge you to please consider that all it takes is one environmental impact to issue a positive declaration of impact. The current findings of the Historic Landmarks Preservation Commission (HLPC) weigh towards a positive declaration, with at least five possible impacts. “I’d like to read a letter dated March 11, 2019 – from the Historic Landmarks Preservation Commission to the Planning Board, care of Suzanne Cahill – into the public record. The Historic Landmarks Preservation Commission, as an involved agency, supports the Planning Board’s request to be the lead agency in the SEQR process for The Kingstonian project. Along with our support, we would like to share with you general concerns we have about this project as you determine its significance. Our concerns are informed by the project applicants’ public presentations and our review of their EAF Part 1 dated Nov 27, 2018. The project site has the potential to yield information important in history or prehistory, such as evidence of the former presence of the stockade which crossed on or near to this site and/or other previously unknown archaeological resources. Such evidence was unearthed nearby on Clinton Avenue in 1970. This site has been identified as archaeologically sensitive by the NY State Historic Preservation Office. This project involves the demolition of an existing architectural resource in the Stockade Historic District and may seek to replicate this building, which might create a false historical record. This project involves new construction in the Stockade Historic District. Potential impacts include those that are construction-related, such as falling objects, vibration (from blasting or pile-driving), dewatering, flooding, subsidence, or collapse. The project’s close proximity to two architectural resources—the Senate House and grounds and the John Tremper House at 1 North Front Street—may negatively impact them if adequate precautions are not taken. Additionally, new construction may impact the visual context of the district, including the architectural components of the district’s buildings in this area (e.g., height, scale, proportion, massing, fenestration, ground-floor configuration, style), streetscapes, skyline, landforms, and openness to the sky. The project may also impact the visual context of the Senate House, a significant state landmark. Taken together—demolition, new construction, and changes to topography—this project may impact the area’s community character or sense of place. The potentially large impacts on the Stockade Historic District and nearby landmark buildings described above weigh toward a positive declaration of environmental significance, we believe. As an involved agency, the HLPC asks that the Planning Board keep these historic preservation issues and concerns in mind as you review and classify the significance of the Kingstonian. This project will be subject to an Article 14.09 environmental review under the New York State Parks, Recreation and Historic Preservation Law. A draft EIS can serve as the review procedure for complying with subdivisions (b) and (c) of Section 428, Part 8 of this law. Thank you for your time and consideration. We value your service to our community.